Deb's Cup of Tea: Wondering about the paper. I get the Daily Herald. I have gotten this newspaper for years, over a decade, I believe. They do more local coverage than the Chicago Tribune or the Chicago Sun-Times. Lately, however, I have wondered if it's worth it. Newspapers and magazines are fighting for their very survival in a media-saturated world. I can get my news from any source now, colored just the way my ideology leans. I certainly don't NEED a newspaper. I can hear the local news on the radio in the morning, the very local news from WDCB, College of Du Page. I get a news feed through AT&T/Yahoo, who provides my Internet service. There are millions of ways to get the news I want or need. The newspaper is not my only option. I bring this up because delivery of my paper has been inconsistent. When Carole was coming, I let the papers pile up in order to clean the house. I sat down over Memorial Day and read a half month's worth of newspapers. Oh I know the Chicago Blackhawks are in the Stanley Cup. I know about the oil spill and the earthquake off Vanuatu. I know about the controversy surrounding President Obama's decision not to lay a Memorial Day wreath at Arlington National Cemetery. Personally, I think there should be a contest. High school aged kids write a 500 word essay on why the president should come to their Memorial Day remembrances. Every state submits one essay and the president decides on May 1st, which observance he attends. I honestly don't think many kids realize why we have Memorial Day. Send the President to their hometown, to speak in their hot and stuffy gymnasium about the sacrifices men and women made so we have a Memorial Day. Maybe you can't stand that year's flavor of president, but you will remember him talking about Memorial Day. I'm sorry, I'll get down off my soap box. Got a bit side-tracked there. As I was reading through my newspapers, I noticed I didn't have all of them. At first, I thought maybe I'd read them, but the randomness of the days missing told me I never got the paper in the first place. Then, on Wednesday, May 26th, there was no paper. I totaled up the missing papers; almost a full week. Why am I paying $43 every 8 weeks when I'm getting 7 weeks worth of papers? I emailed the Daily Herald. It's a thankless job, delivering papers. I remember helping a friend deliver the Cedar Rapids Gazette and collect for the delivery. She had to pay, up front, for the papers and then collect. She got to keep a certain amount, but that was cut when people did not pay. If she quit delivering their papers, they would complain. The paper would give them a credit, which came out of her earnings. So, that misty, foggy, damp and dreary night, she handed me a list of people and I marked down who did and didn't pay her. I did that with her for three pay periods which helped convince the Gazette that some people were deadbeats. Some people would get extra service because, when she came to collect, they gave her a tip. I don't remember the lady who gave us a bag of cookies because she knew we had to walk all over town. I don't know how it is now. I get a bill. There is a spot for "carrier tip". Even in my cash strapped life, I try to tack on a dollar or two. I know delivering the paper means going on in all weather, in your own car, in the wee hours. It's a thankless job and probably pays just enough to cover your car expenses and a bit more. It's probably not something you could earn a livelihood at, support a family. I guess I think, if everyone on the delivery person's route tacked on a dollar every other bill, they would get a nice chunk of change. I'm changing that policy now. The Daily Herald was most apologetic about the missing papers. I've been credited 2 weeks for the inconvenience. But yesterday, there was no paper again. I'm thinking it's been more Wednesday's papers than any other day; never Sunday. 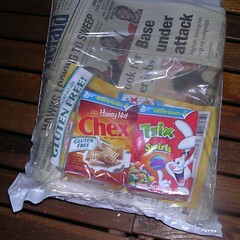 Wednesday's paper contains the food ads. Is there something about that particular paper that is important? There aren't coupons, just a food section. I don't know. I had to go to the web site today and click on "Missed yesterday's paper". I don't want to have to do this every week or 10 days. It's not value to me. I like the newspaper. I grew up in a time when newspapers still had clout and relevance. It could be argued they do not now. I like the feel of a newspaper. The ability to read more in-depth than on the Internet. I also like the freebies that come in the paper. I was very low on cereal and wondering how I could scrape up some funds. A Sunday paper arrived at just the right time. I used the coupon for Chex and got a box of Rice Chex, not the honey nut which was free. Trix, well, "Silly rabbit. Trix are for kids". They were amusing but not in a "must have a box" way. So, we shall see. I probably wouldn't miss not getting a newspaper and my budget would certainly enjoy being $43 richer every other month. Still, I think a little bit of me would pass away without a newspaper. What would I wash windows with? I totally agree about the newspaper thing...I grew up with them. When we could barely afford food and couldn't afford a phone (when Lawrence first went in the Navy and we lived in Memphis and my dad and mom paid for our phone because they couldn't stand for us to not have one) we still got the local newspaper -- even though we didn't know a soul and were only temporary there. I also like the feel of a newspaper in my hands and like to see it lying around the house for two days! Admittedly, ours is a rag...cannot believe a town the size of the Rapids has such a crappy paper. But, although I read a lot of it online, I still expect it to be there when I get home.